Protect the showroom new condition of your seats. 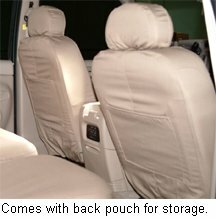 These are the most durable seat covers I have found! The quality material, the construction, and the fit are second to none. The canvas material is soft, durable and cool to sit on. Panels of the polyester/cotton blend are stitched together with heavy-duty nylon and an overlapping color-coordinated seam. This double strength style of assembly guarantees long-lasting durability at the seams the place where the most stress is experienced. 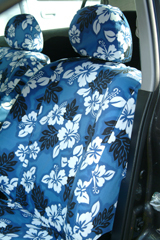 Quality is why we have been selling these seat covers for more than 20 years now. Most customers come back car after car. All seat covers are custom-tailored to fit your seat's unique specifications. Although some electical controls on the sides of the seat get covered, all other seat fuctions are usable. A large back pocket gives you extra storage. All openings, as well as the seams, are re-enforced for durability. All orders include headrest and arm rest covers. Everything gets covered. Our custom canvas seat cover are designed to slip on and off very easily and are machine washable. These seat covers are proudly made here in the good old USA. You have several colors to choose from. To guarantee a good color match when ordering multiple rows, order at the same time if possible. We are not responsible for variations in color if ordered separately. We guarantee that these seat covers are as advertised and will warranty them against manufacturing defects for one year. State your vehicle's make, model and year on the order form. Add any additional information such as: sport seat, lumbar supports, integrated airbags, integrated seat belts, adjustable headrests, armrests. Due to the sophisticated seat styles in today's vehicles, we very often must ask additional questions to insure a correct fit. Please be sure to supply us with a daytime phone number and/or email address. All solid color (non-print) seat covers come from the factory with a silk screen logo of the car's manufacturer, except for those for Ford, Lexus, Toyota and BMW. Custom canvas seat covers are custom made to order. Please allow 2-3 weeks for delivery. Our Custom Canvas Seat Covers come in a variety of styles and colors.